DURABLE MATERIAL: Constructed of high quality thicker coating fabric, with a built in plastic hook. Convenient to hang up. Light weight and durable. EASY TO HANG: Hook makes it on towel racks, shower rods or door knobs. 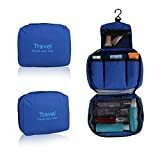 Convenient for vacation, business, gym, camping, travel and bathroom organization. CONVENIENCE: It doesn’t take up too much room in your backpack or carry on luggage but can store a lot of items. For example: towel, toothbrush, toothpaste and other small thing. PERFECT FOR TRIP: This hanging toiletry bag is can satisfy the need for 1-3 days short getaway. FUNCTION: Toiletry Bag, Makeup Organizer, Cosmetic Bag, suitable for both home and travel. A best gift for your family and friends. Size: 22 x 7 x 16 cm (L*H*W). Suitable for business trips, summer vacations, out-of-town family holidays or for dorm rooms or simply heading to the gym. The toiletry kit features multiple compartments in various sizes to accommodate all your everyday essentials. 2 mesh pockets to keep all of your toiletries organized and accessible from perfume and floss to shampoo, skin creams and deodorant. Waterproof pockets with zippers keep items secure no more worrying about bottles spilling and leaking. A handy top hook allows for securely hanging the toiletry kit from a shower or towel rack, making it easy to view and access stored contents. About returns policy and our services. For Toiletry: Upper pocket fit for jewellery, the largest compartment fit in your bottles such as shampoo, conditioner, lotions, sanitary items, bathroom sundries and other wash items. For Cosmetics: Wonderful Gift for make up hoarders, makeup artist or face painting person. Fit for beauty essentials such as tweezers, cream, brushes, eyeliners, eyebrow pencils, lipsticks, make up remover, nail polish remover, foundation, eyeshadow palette, toner, sharpeners, nail clippers and eyelash curlers. For Gym Bag: Use top mesh pocket for towel, second pocket for clean underwear and third pocket for toiletries. For Medication: Fit for meds, potions and first aid stuff. Specifically for toiletries, cosmetics and beauty essentials. Integrated hook under main pocket flap enables you to hang bag on back of door. Plenty mesh pouches to contain small things with convenient handle. Lightweight for easy carrying. – BAGSMART Toiletry Bag is a smart and stylish collection that offers a more flexible choices compare to traditional luggage bags. – A hook under the main compartment allows you to hang the toiletry wash bag on a door, making it easier to sift through contents and prepare for a business meeting or travel day. – The hanging toiletry bag also has a soft handle to carry comfortably. BAGSMART is a professional travel bag manufacturer with more than 10-years of experience in export. We are the expert in Travel Accessories that helps global traveler to organize and pack. Our popular Travel Packing Cubes are our answer to the problems global travelers facing today. If you are struggling to find a practical toiletry bag, this would perfectly meet your needs. Click “ADD TO BASKET” now! Protective hard drive case designed to fit a 2.5 inch external hard drive, complete with two interior accessory pockets for storing cables, USB sticks, and SD cards. A shock-resistant nylon shell and premium quality EVA foam padded interior provide unparalleled protection against knocks, drops, and other damage during transport and storage. Two elasticated inner straps and a full length zip fastening ensure your hard drive is safe and secure; preventing damage to the internal components when being moved. A snugly fitting belt strap and a detachable lanyard are also included to make carrying your hard drive case around more convenient. Exterior Dimensions: 165mm Width x 130mm Length x 40mm Depth ¦ Interior Dimensions: 150mm x 110mm x 30mm ¦ This product comes with a 2 year manufacturer’s warranty as standard. Ensuring your important files are backed up is an integral part of computer maintenance but how you store those backups is equally as important. In order to avoid damage from knocks, drops, scratches, moisture, and temperature changes you should protect your external hard drive in a durable hard case that features an ample amount of padding and secure fittings. 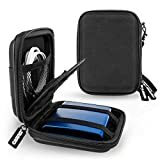 Fortunately, this Caseflex hard drive case does exactly that; with a tough nylon shell that protects from hard impacts and scratches and a padded foam interior to absorb any damage from drops and knocks; you can rest assured that your precious memories and hard work are safe and secure at all times. In addition to protecting your external hard drive, this Caseflex hard drive case includes two mesh pockets for easily storing your cables, USB sticks and SD memory cards. It also features a belt strap and detachable lanyard for easy transport. This Caseflex hard drive case is fully compatible with all 2.5 inch external hard drives including the Seagate Wireless Plus, Seagate Backup Plus Slim, Toshiba Canvio Basics, Western Digital WD Elements, Western Digital WD My Passport and more.